Saja, 12, fled the fighting in Aleppo with her family, and they are now looking for temporary shelter. She lost her four best friends in a bomb attack over two years ago. She also lost her leg in the attack. A new wave of attacks in the Syrian city of Aleppo has forced thousands of children and their families to flee their homes, while the eastern part of the city has been cut off from humanitarian aid for nearly a month. UNICEF is calling for immediate access to deliver urgently needed nutritional supplements, medicines, critical health supplies and clean water. ALEPPO, Syrian Arab Republic, 2 August 2016 – Children in Aleppo city are again facing terrible threats from new intense attacks and fighting in the western parts of the city, while around 120,000 children are among the nearly 300,000 people cut off from life-saving humanitarian aid in the east. In the past few days, violence and fighting escalated with children in the line of fire. This Sunday evening, mortar attacks threatened thousands of families in what became the front line neighbourhoods of ‘1070’ and al-Riyadah – a community of 25,000 people already displaced by the Syrian conflict, living in makeshift shelters. Over the past two years, UNICEF has worked intensively with other UN agencies and partners to support these displaced families with water supply, education, psycho-social support and health services. By night’s end, virtually all 25,000 people, including around 12,000 children, had fled the bombardments with nothing more than the clothes on their backs. Three of these families are those of Saja, Fatima and Alaa – girls UNICEF has worked very closely with for months. © UNICEF Syrian Arab Republic/2015/Al Issa Fatima,10, and her family lived in the al-Riyadah neighbourhood in Aleppo, and she was enroled in one of UNICEF’s accelerated learning programmes. She fled the fighting on Sunday and her family is now staying with relatives. Twelve-year-old Saja lost her four best friends in a bomb attack over two years ago. She also lost her leg in the attack, and her dream of being a gymnast. When we first met Saja over six months ago, we were inspired by her courage and resilience. 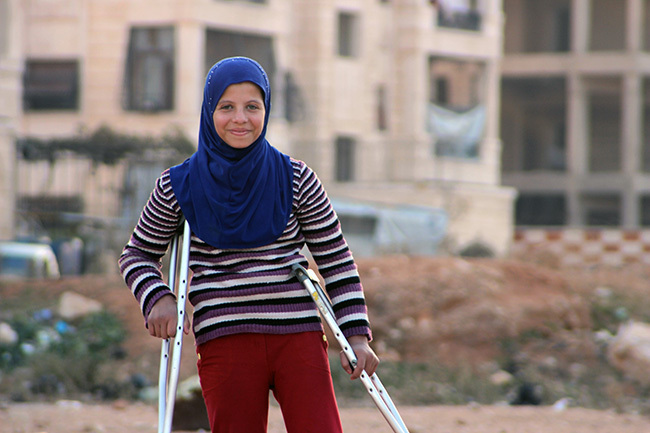 Despite losing her leg, Saja was determined to walk the long road to school every day and continue her education. On Sunday evening, Saja was in such a hurry to flee the shelling and fighting that she left barefoot. The family is now trying to find a temporary shelter. Ten-year-old Fatima was out of school when we first met her early this year, collecting water for her family and carrying a jerry can too heavy for her growing body. Fatima was excited about getting back to learning, and with help enroled in one of UNICEF’s accelerated learning programmes, where she made new friends. On Sunday, Fatima and her family fled the fighting, leaving everything behind. They are now staying at a relative’s house. Her 15-year-old brother tried to go back to their house in al-Riyadah shelter to collect some belongings – but shelling and sniper fire stopped him. Nine-year-old Alaa had been displaced for three years before arriving at the unfinished apartment building two years ago. We met her while she and her two brothers were making a trip to fetch water for the family. Alaa always took an extra bucket to fetch water for her doll, so she could bathe her and wash her clothes. When the fighting broke out she ran for her life, leaving everything behind. The family is now staying with their relatives who have 10 children, living in a couple of rooms. © UNICEF Syrian Arab Republic/2016/Al Issa Alaa, 9, drinking clean water supported by UNICEF WASH programmes. When the fighting broke out in her neighbourhood, she ran for her life. She and her family are now staying with their relatives who have 10 children, living in a couple of rooms. Alaa’s mother told us about the fearful rush to escape. “We climbed into trucks like cattle, like herds migrating,” she said. Around 2,000 families have gathered in three new centres set up by a local coordinating committee, and supported by UNICEF and partners. Collective kitchens are feeding 10,000 people at the centres. UNICEF is delivering emergency safe water trucking to the three centres and coordinating with the local committee and partners to organize other assistance in these centres. During the attacks, an electricity transmission station was damaged, cutting water pumping to the city of two million people. Ongoing fighting is currently preventing repairs, and in the meantime residents rely on the alternative systems built by UNICEF and our partners – 70 wells to provide a sustainable back-up supply, in addition to 100 recently cleaned and disinfected water storage tanks. At the same time, around 300,000 people in the east of the city remain cut off from humanitarian supplies and assistance, since early July. UNICEF and partners need immediate access to urgently deliver nutritional supplements, medicines, critical health supplies and clean water. The health system in the cut-off eastern part of the city is especially devastated, as four hospitals were hit in strikes in the past week. Only 30 doctors remain in the east, to serve the population of 300,000. Aleppo city is one of the most dangerous places in the world for a child to be in. Protecting all the children of Aleppo is more urgent than ever as Saja, Fatima and Alaa – and so many thousands of children like them in Aleppo – try to survive this latest crisis.